In the spirit of exploration and education, Living Passages’ Christian cruises focus on traveling to Biblical locations in Greece. These unique opportunities to hone in on some of the Book of Acts most interesting Greek sites will allow groups to explore sites like the Island of Patmos, Corinth, Cenchera and other sites in greater detail! Explore unique opportunities to travel and uncover some of the Book of Acts most interesting Greece destinations while following the apostles’ adventures! The Island of Patmos: Enjoy a once-in-a-lifetime teaching opportunity in the garden outside of the cave where John received the Book of Revelation. Including, a spectacular “gate of heaven” study option. From a lovely vantage point of the city, your group will study the Book of Revelation that John received while banished there. Corinth: This exciting ancient city is a treasure trove of Biblical history. 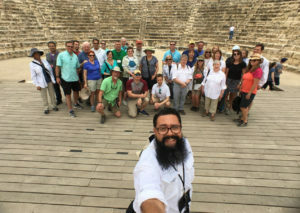 Teach in significant locations such as the inscription of Erastus, the Bema where Paul took a stand against his charges, where he along with Priscilla and Aquila worked as tentmakers, the Corinth amphitheater and more! Cenchrea: This is where we read that Paul, having taken a Nazarite vow, came to the end of the designated time of this commitment to the Lord and cut his hair. We can picture this scene taking place on the beautiful beaches of Cenchrea. Also, Paul in Cenchrea gave Phoebe the parchments that later became part of the New Testament. Partake in the Bible study journey of a lifetime and explore the most authentic Biblical locations throughout the Mediterranean! Our authentic Christian travel experiences offer exclusive historical site access that you’ll only see on a Living Passages tour! Please visit our upcoming Bible tours page and our upcoming Christian cruises page to browse all the available trips we have scheduled for the next few years. We offer specialized Christian travel for a variety of interests and purposes! Our most popular trips are the Footsteps of Paul tours which explore the life and ministry of the Apostle Paul. For the more adventurous Christian, we recommend our Biblical archaeology-centered travel with Eli Shukron exploring the latest finds in Jerusalem. We also offer Christian African Safaris to inspire and edify your whole family on a creation education vacation! For the intrepid Berean and Christian scholar we offer historical European Reformation tours which explore the rich Christian heritage of Europe. Have any questions about what to expect on a Living Passages trip or need help finding the perfect tour or cruise? Call us at 1-888-771-8717 or write us at [email protected] for more information! Explore the Island of Patmos Where the Book of Revelation Was Written!